From the introduction: The production of the vehicle was started on the break of 1937/38 based on the request of the British War Office. Two companies undertook the production: Guy Motors from Wolverhampton and Morris Commercial Cars (MCC) from Nuffield with the support of Anderley Park and the City of Birmingham. Guy Motors used chassis components from their 4x4 ''wheeled light tank" (the predecessor of Karrier-Humber Mkl. through Mk.IV). The first vehicles were with open body, and later with its characteristic "hunchback" shape. The War Office has decided to use this vehicle to pull the new 251b howitzer, which replaced the obsolete 181b and 4.5 inch howitzers ofthe Royal Artillery. The office requested a compact four wheel drive vehicle, with covered body which will fit the howitzer crew comprising of six men and will have storage space for ammunition and batteries. The rear tailgate was to be used to carry either "spare" machine gun or spare tire. The vehicle was supposed to be able to tow other artillery piece together with the howitzer. The production capacity of Guy Motors was relatively low and was not sufficient to satisfy the requested quantities, therefore the majority of the production was carried out by MCC from Nuffield, Birmingham with their own type of vehicle, and which was followed by other companies Karrier in Luton, Ford and General Motors in Canada. Just prior to the serial production launch, the chief design engineer of MCC went on a "research trip" through central Europe. He spent several months in Germany, Austria, Czechoslovakia, Switzerland and Italy, where he studied the latest military vehicle designs, and was even successful in getting some samples for testing by MCC and the Army (WVEE) in Farnborough. These sample vehicles were: Steyr-Deimler-Puch from Austria and Tatra from Czechoslovakia. The Austrian 4x4 vehicle was most probably considered as the most advanced and MCC copied certain details from these vehicles, and improved the design of some, which were later filed for patent by MCC. MCC presented the War Office with a prototype of the 4x4 vehicle in two designs: one design with simple and one with highly sophisticated chassis. The later, version had main tube chassis sections fixed at the end of the differential gearbox, which was attached by radial holders and extended all the way to the wheels. The radial holders were also of a tube design and contained the drive shaft and drive gears. 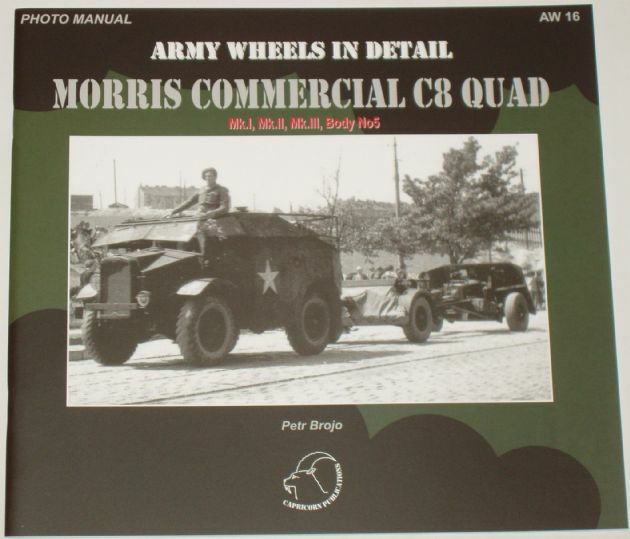 Ten of these unusual chassis, known as Model QW, which were produced in 1938-39 and additional six rear sections (model Q) were deigned for armored vehicles. A competitor design was later used for the light wheeled tank of the Guy Motors, but it was not very successful and did not fulfill all the requirements. The proposed C8/FWD Morris Commercial Field Artillery Tractor, launched the serial production on the 29th November 1939, based on the contract V3539 (294N3539) awarded to MCC and which specified the production of 1000 vehicles. The approved serial number sequence was 1587. This number was subsequently used as the chassis serial number. The chassis of C8/FWD Quad were quite substantially modified, when number of components from the rear section was mounted on a narrowed steel spar extended all the way to the ball joint at the front of the rear axle. There were other modifications made to accommodate an independent front suspension and this design was patented. The engine used was a 3.51 (3519cm3), four cylinder, water cooled Morris Commercial EH with side valves and multi-pressure carburetor. The gearbox was a 5 speed with a PTO for the winch. Several essential defects were discovered during the initial production and testing. The front half-axle was not detachable and there was an absence of central differential gearbox, the drive mechanism alignment was insufficient and in connection with the relatively long drive rods caused vibrations in the steering. The gas pedal was not ergonomically placed either, and was even causing leg pain, and the body of the vehicle itself needed to be modified substantially in several areas as well. Several mentioned modifications were introduced after the initial production of 200 vehicles. These modifications included simplified axle and WD design of the hitch mechanism. These 200 vehicles were designated as Mk.I and the new serial number was 1654. WD registration was H4107701-4107900 for Mk.I and during the duration of the initial first contact for Mk.II the registration was 41 008700. The main defect of Mk.I vehicles was that the front axle was causing the differential gearbox to get blocked. All the way through Mk.III there were 5 types of front axles used (FZlFZAlB/CID ).